One thing that never changes in our lives is the desire to spend quality time with family and friends. During these special times we all like to make these moments memorable. What better way than sitting around a Fondue Pot eating some mouthwatering treats while we laugh and share our life stories. The Dowan’s Stainless-Steel Fondue Pot is made just for these kinds of occasions. 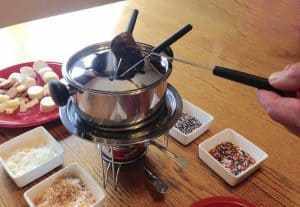 When choosing a fondue pot you will want to choose a pot that fits your needs. The Dowan’s Stainless-steel pot is exactly the right size for both of our needs. At 1 ½ quart this fondue pot will hold more than enough food for a nice size crowd. This fondue pot comes with 6 forks that will sit comfortably against the spatter guard for easy use. 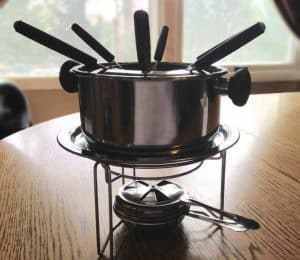 The fondue pot comes with a 3 legged stand, anti-scald handles, fuel burner and a plate stand. This stainless steel fondue pot is made of high quality materials that can hold up to high and low heat usage. A gel fuel burner is what gives the heat to this pot. You control the heat with the lid of the fuel burner. There are so many uses for this large size fondue pot. 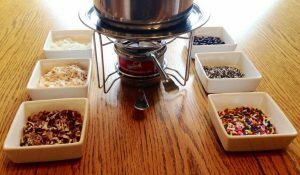 You can melt chocolates, cheeses, butters, dips and so much more. Another use for this pot is heating water, broth or even soup when camping or even in a power outage. The Dowan’s stainless steel fondue pot is lightweight and portable which allows you to take it anywhere. This stainless steel fondue pot can be used indoor or outdoor. You will be the star of any party if you show up with a fondue pot full of yummy treats at any function you attend. Maybe you are going on a picnic, camping or having a backyard barbeque this pot will add that something special to your gathering. It is important to know your that the Fondue pot will arrives safely. This is why the company has taken extra steps with their packaging by updating their methods. As with all of Dowan’s products they offer a 30 day Product Quality Warranty. What will make your fondue party even more perfect is a set of square ramekins. These 6 ounce ramekins hold ¾ cup of fruits, vegetables, snacks or anything you want. Ramekins are great for custards, puddings or just to dress up your table setting. High quality of white lead free porcelain ramekins are microwave, oven, freezer and dishwasher safe. 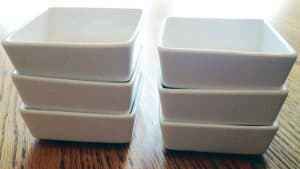 These square ramekins are stackable and take up very little space at 3.5” x 1.3”. Make anytime special by adding these classic white ramekins to your gathering. When using a fondue pot and ramekins it can turn any party into a memorable experience. Though, you will want to choose the right recipe. Amanda and I both decide to make chocolate fondue sauces. The dipping items allow for an endless of possibilities. Apples, bananas, marshmallows, cookies, pretzels are just a few suggestions for dipping. Take it a set further and add toppings to your ramekins. Chopped nuts, sprinkles, coconut, crushed cookies and so on. Fondue pots are fun, but some safety precautions are necessary. Never use the pot empty make sure water, oil or your dipping sauces are added. Never blow out the gel burner close the lid to the burner and the flames will go out. Use the anti-scald knobs to move the fondue pot and remember the outer surface of the pot will be hot. Always allow the stainless steel fondue pot to cool completely before clean and storing. The Dowan Family would like to join Blitzin’ Reviews and More and Margie’s product reviews in a giveaway. Enter to win a fondue pot and a set of porcelain ramekins. Enter below. Good luck everyone! Bring the cream to a simmer and add chocolate. Then stir until all the chocolate is completely melted. Transfer the melted chocolate to the fondue pot and set the burner to low. Dipping items: Marshmallows, dried pineapple, vanilla cookies, cake, pretzels, bananas, apples and so on. I would definitely make a chocolate fondue with fruit. My husband would want to do cheese fondue as a meal, with chicken, veggies, and breads to dip. He is a cheese nut! I remember having fondue growing up with my grandma. We used to have as a special occasion meal with family and do steak, chicken, sea foods and vegetables those were some of my favorite childhood memories. Thank you for great review the chocolate also looks quite tempting would love to own one to try that!! This is such a perfect thing to have for sleepover!! 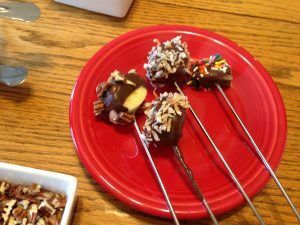 The kids would love chocolate covered fruit …….. Great review! I would make chocolate fondue to go with the some juicy strawberries! I would use this alot. You can dip so many things into chocolate. I would dip strawberries, pretzels, marshmallows, cherries, rice krispie treats and more. This This would be great for cheese dips! I could use this for all the family gathering that we have! This would be great for my chocolate obsessed other half. I can see him dipping half the house in chocolate. Great review.